Joel K. Ortega focuses his practice on first and third party insurance defense, as well as personal injury protection including bodily injuries, slip & fall, motor vehicle, and medical malpractice. Mr. Ortega understands the importance of regular communication with insurance carriers and clients to provide status updates and risk exposure analysis at all stages of litigation. He is always responsive and available to his clients. 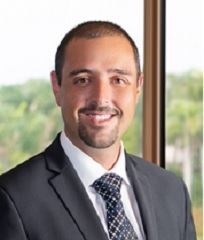 Prior to joining the firm, Mr. Ortega was an attorney at a large Miami based firm, specializing in insurance defense.